Truthfully after i did the test cuts, and forgot to video them I put my plasma cutter assembly away and haven’t had a chance to use it again. If you are looking to cut steel you can order a cheap plasma cutter for less than $300 on the internet. These supposedly pull 20 amps and I haven’t checked but its thrown every 20 amp breaker I’ve tried it on. I ended up wiring a 30 amp breaker to two outlet to supply. You will have to custom build a method to turn the plasma on and off but this is fairly simple. The only extra advice I have is to make sure your whole system is grounded and to put your power, on/off relay connection and computer cables through ferrite cores. Because the plasma cutter will generate generic radio frequency style interference it can actually disable your computer. The computer case itself if properly grounded and kept away from the plasma cutter will help. The ferrite cores will stop the plasma cutter and computer cords from acting like broadcasting or receiving antennas. The laser diode is very easy. It uses the regular 120v power relay like all the other tools and can cut or burn depending on what you need. Here I cut out a storm trooper stencil. Black paper works best as the light cannot escape and become heat. 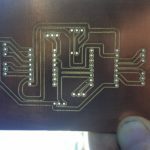 The post CNC Plasma Torch and Laser Diode appeared first on SignalHillTechnology. So I decided to build my own temperature control unit. Here is my, Errrr masterpiece. Here is the layout of my circuit board. This layout above doesn’t show some things on my board like my voltage regulator for 5v power or my electrolytic and ceramic capacitors plus inductor for decoupling. I realized I needed those after I had mounted all this. YIKES!! My micro controller has 3 tasks on a continuous loop. 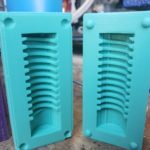 The post Building the 3D Printer Temperature control from an arduino prototype appeared first on SignalHillTechnology. I use two computers, one for design and one for machine control. This allows you to run the machine and design stuff at the same time. Design software can cause your computer to slow down and should not be run on the same machine. Software for controlling the machine is pretty straight forward. I dabbled with linux CNC and considered another option as well but by the time I got to this point I really was just ready for something to work without fighting it. So I ended up choosing Mach 3. It allows you to download a trial version to make sure it works and there is a ton of documentation/ user forums to support it. As you know the software connect to my breakout board through a parallel port with is a 25 pin serial port. Many people are switching to USB which is the new standard but since my older computer had the serial port I chose that option. I use fusion 360 to do my design work. They offer it free to people who are learning to use it and when you start making some money its very affordable for subscription. They are competing with solid works and I suspect they will overtake them based on their business model of allowing students to use it for free. I also use some different software for my laser to convert images into 2D cutouts and a slicer for my 3D printers .stl files. I use a website called sharedrop.io for sharing files between design and control computers. The difference between many commercial and home built units is obviously some of the nicer finishes encapsulating the unit but mainly the enclosed work space. To enclose my work space I used a 1/8 acrylic sheet to enclose it with a cheap window curtain sprayed with a liquid rubber known an plasti-dip. Also you will notice that I used extra bracing on the main gantry. This is because I compared the bottom of the gantry with the top and decided that it needed more rigidity and support. Most unit are connected to several points along the sliding rails at the bottom and the tops are attached to just the gantry. By adding some lightweight angles across the top I great stabilized the entire machine. Open this above picture full size and you will see that I went from the standard 2 points of connection to a new 6 point connection. I estimate the weight at maybe and extra pound or two which isn’t much considering I reduced my original construction by about 10 lbs by using 1/4 instead of 1/2 aluminum plate. Of course I am not weighing each piece or testing the vibration with some type of meter. Its a very qualitative experience using my sense of sight and sound. I highly recommend this extra support although I admit this things looks like a beast! The post CNC Software and Enclosure appeared first on SignalHillTechnology. I chose 425 O.Z. inch stepper motors because I wanted to have some strength to perform tougher tasks. They came grouped as a kit with a power supply and motor drivers. Below is a visual representation of oz inch. It literally means that many oz at an inch away from center. How does this help you? 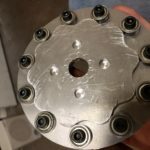 It probably wont because if you have ever worked with a router or table saw before you know that not much force is needed to push the cutting bit into the material. When building a machine you have to realize that milling metals will be your most difficult challenge. You also have to understand that these motors could mill through any metal on earth if you use a low enough feed rate. But this low feed rate will depend greatly on finding a proper spindle. Not only that but you have to consider the ball screw break away which keep the machine parts from deforming quickly. Just for fun consider this formula I found for calculating the force your ball screw might be able to supply. Some common motor sizes for the lazy. These of course vary depending on your thread pitch and the speed you want the machine to move. Now I went with a kit but basically each stepper motor needs a DC power supply and a motor driver that can handle the amperage and voltage. Here is a great diagram of how they should basically work. Your motors are wired to drivers. Your drivers decide which coil to power based on the breakout boards directions. I used the 18 volt wiring you can get at the hardware store for air conditioning wiring. The only thing I don’t agree with is the E-stop being integrated into your circuitry. You should have a regular 120v on/off switch that can instantly shut down your motors and spindle without relying on an integrated circuit. Your motors should come with directions explaining which wires are paired. I had a 4 wire motor with Black/Green and Red/Blue. These get wired into the drivers. My drivers are set up active low as opposed to active high. Active low means that a DC circuit is being switched by connecting or disconnecting the negative wire. Active high is done by controlling the positive wire. So in my active low setup I ran my positive 5 volt power supply into each of the drivers positive terminals and connected the 5 volt power supply to the breakout board which will control the flow of power to these circuits. In the picture above you can see the wires exiting the drivers – PULSE and – DIRECTION port into my breakout board. Lastly set your resolution or steps per rotation. This will determine how many pulses your driver will need to make one complete rotation of the motors shaft. I set mine to 1600 which is fairly common. You can use 28 gauge cat v wiring for your limit switches and 18v for everything else. Never use the relay built into your breakout board. Add another circuit to help isolate it. Always solder connections after you are sure they work. Wire nuts will fail eventually. The post CNC Motors and Electronics appeared first on SignalHillTechnology. In my pursuit of designing and building new things I have constructed a CNC machine of my own design with the help of some parts ordered over the internet. I made a short video explaining what it does as I continue to perfect the machine. Here is the video introduction where I talk about the machine in general and what it does. When planning on building a CNC machine there are a few things to consider which will help you choose the type of machine. A CNC (Computer Numerical Control) machine is a tool used to move a tool tip in a 3D space using computer controlled motors. A tool tip can be anything from a marker to a laser beam. Similar to a person using their own hand a CNC machine can manipulate this tool in space in a variety of ways. The machine I built is a 3 axis machine meaning there are 3 motors which can move the tool tip either Forward?Backward, Left/Right or Up Down. Here is a picture of mine in the earlier stages. As you can see I chose to build a frame which sits on a table. The work bed is stationary and I have a gantry which rolls up and down the length of the X axis. The Y axis moves side to side along the gantry. Missing from this picture is the Z axis which will move up and down. Many people have their x and y reversed to mine to match the perspective of a typical graph but it all depends on where you want to sit in my humble opinion! However there is another popular set up which is the moving bed set up. In this scenario the gantry is stationary and the bed moves back and forth along the axis. The advantage of the moving gantry is you can more easily connect hoses, sprayers, bellows, dust collectors etc. The advantage of the moving bed design is the bed is usually lighter and smaller. Also the moving gantry will give you a small advantage in how much work space you can use. If you only plan on doing 3d printing or jewelry engraving you will build a “weaker” machine in general. This will be an ADVANTAGE because smaller motors and a lighter gantry or movable bed will allow the machine to move quicker. If you plan on milling wood or metal you will need to use stronger parts. This will however make the machine more difficult to build and it will probably operate slower. Here is another video where I run through the major building aspects. So you probably understand what a CNC is used for so let me talk about some dos and don’t I learned from my project. The size of the machine is important because most people have space issues. By the time your done the working area will be about 5- 10″ shorter than the table your machine sits on top of. I recommend building a custom table for your machine because there will be lots of parts and wires hanging from it. Better those walking by bang the table than your CNC machine. Size is also a critical factor because the bigger the machine the more issues you will encounter. One of the major issues people encounter is their longest ball screw sagging. Many builds have a ball screw as long as the builders arm. Hold your arm out and see how long before it begins to sag! Your machine is no different. The ball screws I purchased deflected a slight amount and as the motor spins it creates a wobbling motion which makes the machine vibrate or shudder. This requires all kinds of custom hacks or more simply a larger ball screw and motor. However don’t go too small if you plan to use lots of tool tips. My machine takes a variety of work surfaces such as a glass table, a vacuum table and a contained vice table. Each of these tables has to be about 6″ smaller than my CNC work platform width. Some even smaller. Here is my 3D print table on right. On left is my contained vice. By contained I mean it has wall to contain flying cutting fluid. Frame construction is a trade off between weight vs strength. The stronger the better as it will resist outside forces. 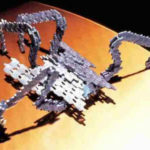 But the bigger it is the more power needed to manipulate the frame, the more weight it will throw around while moving. This will test the limits of your table and the linear rails supporting it. In my video above you will see that I used 1/4 aluminum and braced is with aluminum angle. Many people choose to use 1/2 aluminum but I made the assumption that the 1/2 aluminum, although strong added more weight than it was worth. So I chose to add the aluminum angles not to add strength but to add stiffness. Stiffness isn’t the ability to withstand a heavy load. Stiffness is the ability to resist deflection even under smaller loads. When attaching these angles it became quit clear how effective they are and this is one modification I would recommend to everyone. The base I chose to make from steel. This was a naive decision in which I though my machine would be so rugged and accurate that it would need a steel frame to withstand the eventual torture test I would put it through. However the aluminum extrusion people frequently use would probably have been more accurately installed. I purchased this kit from amazon. I can’t really complain because considering the price it has done a fairly good job. However these are definitely hobby kits. Recommended for your first build they will function quite well. Now consider how to connect the linear rails. Notice below how my rails are facing sideways. This design is less than ideal because it is putting the weight onto the bearing at a perpendicular angle. Only a part of the bearing is supporting the weight and this will likely reduce machine performance and longevity. Secondly This machine uses ball bearing sliding directly on the rail. This is also a less than ideal situation because these can collect dust which will shorten the life of the machine. Anytime you see linear motion devices with round rails know that you are using the rails I don’t recommend. Below is a better solution. Its a v bearing on an angles piece of metal. The advantage is that the bearings are protected within and the minor dust on the rail stays outside. These might come exactly like you see here or the may come in a CNC specific set where there are two opposing angles like a double edged sword with v groove bearing on each side to eliminate unwanted movement. 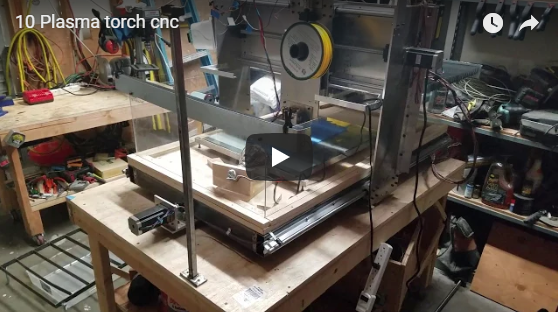 The post My CNC setup for small scale manufacturing appeared first on SignalHillTechnology. Here is a list of all my posts regarding my CNC machine. The post CNC Machine appeared first on SignalHillTechnology.